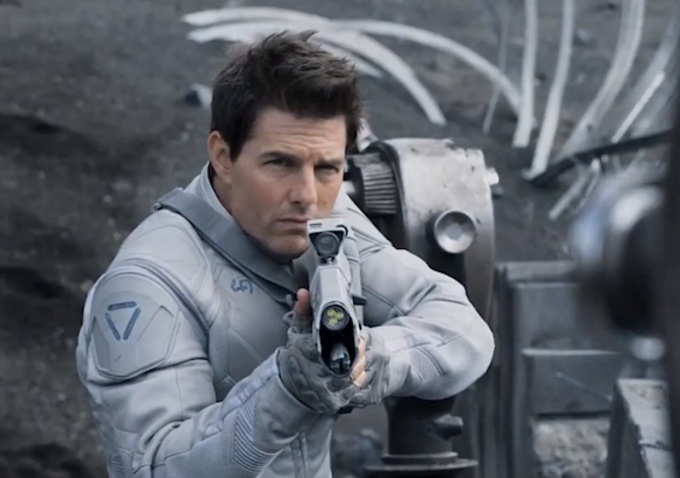 Cruise in a scene from "Oblivion"
The 50-year-old actor is famous for doing his own stunts and despite being a huge Hollywood star, he throws himself into every action sequence without complaint. Defence Lab's Andy Norman, who was the fight consultant on 'Jack Reacher', exclusively told BANG Showbiz: "Tom gets right in there, he'll take the knock and the bruises and he doesn't want us to hold back. He'll still be there at 2am going over fight scenes, he's a total perfectionist." Andy also revealed Tom is involved in every stage of planning the fight scenes in his films because he wants to get the emotion behind the action right. He explained: "A fight scene like the one in 'Jack Reacher' where he takes on five guys at once can take up to eight weeks to put together and Tom is involved from day one. "The process is quite collaborative because you've got the emotion from the script and we have to see how Tom wants to show that emotion and we work out how to put that together from the movie." 'Jack Reacher' is available on DVD, Blu-ray and Digital Download in the UK from 22 April.